I've tried out all of my Xbox games now (except Forza Motorsport, because I don't do racing games), just to get a taste of what each one offers. Here's my opinion on each. Keep in mind that I haven't completed any of them, and I'm not a gamer. So my evaluations are based on different values than that of what a hard-core gamer or fan of a particular title might look at. I'm going to skip my usual rant about the Christmas season and go straight to the part where I talk about all the fun material goods I acquired. Oodles and oodles of chocolate and candy, firstly, which is never a bad thing. Plus some movies, season 2.0 of Battlestar Galactica, some nail clippers, some desk calendars, and some games for Xbox 360. What was that? Xbox 360--surely Ben doesn't have an Xbox 360! I bought one today. (For those of who aren't commonwealth, today is Boxing Day, and is usually the beginning of a week of mad discounts, similar to the American Black Friday.) I got Tomb Raider: Anniversary and Assassin's Creed for Christmas, and then the console came with Marvel Ultimate Alliance, Forza Motorsport (which doesn't really interest me), Halo 3, and Two Worlds. Then I bought Viva Pinata for some light-hearted multiplayer fun. So I am decked out for games now. So what if it's plastic and doesn't actually unlock things (which would be ever so slightly illegal)? It still makes authentic noises, extends, and lights up. Plus it pulls double duty as a regular pen and a UV pen! Yes, I'm talking about the sonic screwdriver toy. It may be a simple toy, but it makes me happy. :D The sonic screwdriver is a brilliant little device from Doctor Who, so even a plastic replica is cool. However, this toy is slightly special because it isn't based off the prop--the prop is based off the toy. The producers were so impressed by the durability of the toy that they acquired the moulds and used it to make a newer, slightly larger sonic screwdriver. So that's neat. I'm finished all my exams. Classes are done. Aside from work and the inevitable demands of Christmas, I am on break until January 7. ^_^ Let the relaxation begin. Or at least, that's what I'd like to do. I've got tons of stuff I want to work on, however. I have several website-related projects, one of which is particularly dear to me. I've been working on it since about September; I don't know how it will pan out yet, but I really hope it goes well. It's just a huge task, since I'm doing everything from scratch. I haven't forgotten about VSNS Lemon 4 either! The trouble is, I don't want to release it until I upgrade this blog--and I don't want to upgrade this blog until I have redone everything for PHP 5. That means a new design, and therein lies the crux of the problem. Design has never been my forte. I can execute designs, but creating them ... mmm, not so much. In non-computer related tasks, I have plenty of writing I want to do--not so much inspiration. There is no other way to describe it. Since it started four days ago, winter has systematically and ambitiously blotted out any trace of summer from our lovely little town, plunging us into a deep snowy (literally) miasma of cold. And that isn't necessarily a bad thing. But there is snow, and lots of it. 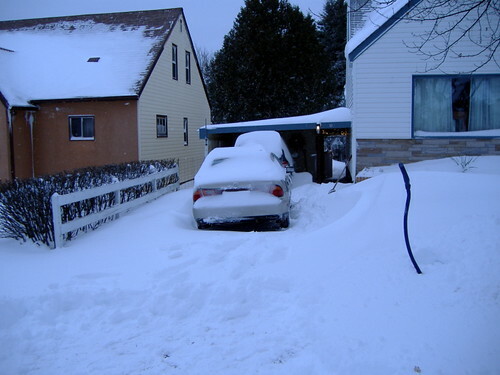 My dad and I spent about an hour shovelling this morning--and that was just to clear the driveway so I could go to work. For those of you who live in an area that does not get snow, or not much snow, then take a look at these photos to get an idea of what our winters are like (some are more mild than others). For those of you who also deal with massive amounts of crystallized water, then I feel your pain. Don't get me wrong: snow is great. I love shovelling. But sometimes, the sheer volume boggles the mind. I woke up this morning, went outside to shovel, and it just ... it looked insane. It was insane. This is all insane. Welcome to Canada. Pick up a shovel and leave your sanity at the door. Every time I try to get Kubuntu working, I become more and more convinced that Kubuntu just doesn't want to be friends with me. It's always a mixed bag. It's not all Kubuntu's fault--it's a very nice Linux distro, functions well--sometimes I'm to blame. Still, the learning curve--and the bumps along the way--are disheartening. Yesterday I decided to do a clean install of Kubuntu 7.10 ("Gutsy Gibbon"). My hard drive was already partitioned because I had Feisty installed, but I didn't have the time to devote to learning how to use Feisty properly. Unfortunately, the installation decided that I had burnt the disc at too high a disc speed--but it didn't tell me this until 63% of the installation was done. As a result, Grub was destroyed, and I couldn't boot into Windows. I had to download the image again on another computer and burn it to my last CD-R at a lower speed. Then I ran the install again and prayed it would work.